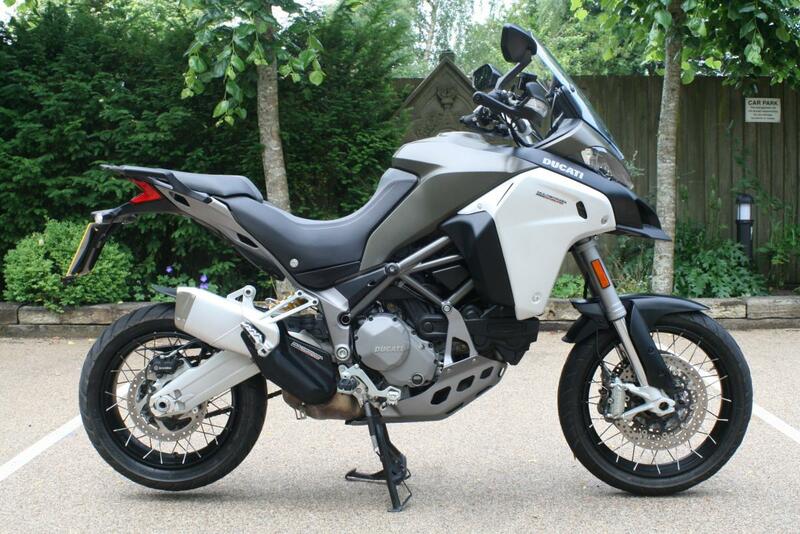 We are thrilled to be able to offer you this stunning Ducati 1200 Multistrada Enduro. Fantastic bike, fit for every occasion with a go anywhere attitude. Low rate finance is available, credit subject to acceptable. A must have from every adventurer out there. Last serviced on 18/05/2018, Full dealership history, Excellent bodywork, Tyre condition Excellent. Standard Features - ABS, Traction Control, Cruise Control, Heated Grips, Screen, Belly Pan, Touring screen, 2 keys, Centre Stand, Electric start, Hand Guards. Matt Grey. Ducati's superb 1198 cc v-twin adventure bike. 2 owners from new, this bike boasts a full Ducati service history and is offered in excellent condition. Ducati has given its superb Multistrada 1200 the ‘Tonka Toy’ treatment and created a genuinely competent off-roader. Featuring 60 redesigned components, the 1200 Enduro is a bruiser of a dirt bike to rival the BMW GS, Triumph Explorer and KTM 1190 Adventure. But it still retains its exciting road manners and demolishes big miles in comfort. There’s no getting away from the fact that this is a big bike. The seat is an inch taller than the standard Multistrada’s and the bars 50mm higher. With its big 30-litre fuel tank it’s wide, too, so shorter riders will struggle to get both feet down at a standstill, especially off-road. It’s a bike for the taller rider, or a confident off-roader. But with its tuned semi-active Sachs suspension the Ducati irons out the road ahead and even riding over rocks, you’d swear you were on tarmac. Handling on the dirt is excellent and it’s actually pretty nimble on tricky sections. New spoked wheels (with a 19” front) are shod with dual purpose Pirelli Scorpion Trail II tyres and give lots of grip and confidence in all conditions. A comfortable riding position, excellent wind protection and goodies like heated grips and cruise control all add up to make the 1200 Enduro the perfect cross-continental companion. Low rate finance is available on this bike, credit subject to acceptance. For a no obligation finance quote, please call, 01747 811196 and select option 1 for sales. Thanks for looking! !